Moving time: 9 hr 6 min. Quite a day. I did my first century ride today. To cyclists, a century is a ride of more than 100 miles in a day - I did 107 with a fully loaded touring bike over some very crazy terrain. I don't suppose I'll push myself that hard again. I'm just trying to get caught up with the mileage. 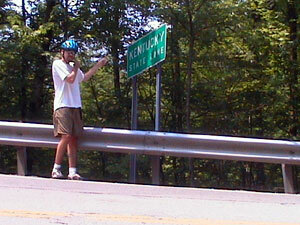 I also rode into Kentucky today - finally done with Virginia which is the longest and many say the hardest of all states. The mountains in Kentucky so far are much steeper than those I encountered in Virginia. Some of the climbs are absolutely crazy and the descents wore my brakes down pretty good. I'm due for new brake pads front and back in a few days if this keeps up. I never thought I'd go through brakes like this! 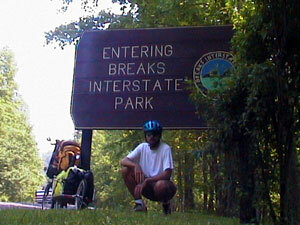 The Breaks Interstate Park is shared and managed by both Virginia and Kentucky and is many square miles in size. The campground is actually four miles off route and is the typical place to stay but I pushed onward and upward. 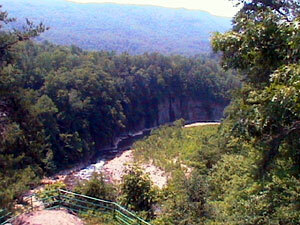 The second photo shows a very nice, deep gorge with a fairly high volume river, the Pound River. People were rafting and tubing in the gorge below. I experienced Appalachia today in its finest. Lots of stray dogs, confederate flags, El Caminos, ATVs, tobacco fields, coal trucks and shoeless kids. Every home is a mobile home but I don't think these people have ever left. I considered camping along side the road and not push it to Pippa Passes but then I had thoughts of some of the scenes in Deliverance and rode on. The gene pool is very shallow here and either needs some chlorination or some fresh blood. 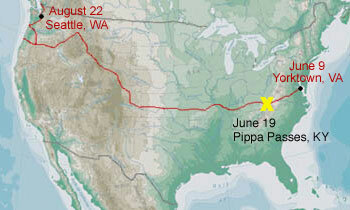 The hostel I stayed at is the Pippa Passes American Youth Hostel (AYH) in Pippa Passes, KY. The hostel is a home hostel hosted by Charlotte and Ed Madden who have hosted TransAm cyclists since the inception of the route in 1976. This town is the home to Alice Lloyd College which is set in a gorge in the middle of town. It is a very beautiful, woodsy, well maintained campus.